This idyllic oast house conversion offers the best of town and country. Kent has a long and fruitful relationship with beer. With local water filtered through the chalk ground and a world-renowned hop crop, the county has all the ingredients to make the perfect pint on its doorstep. 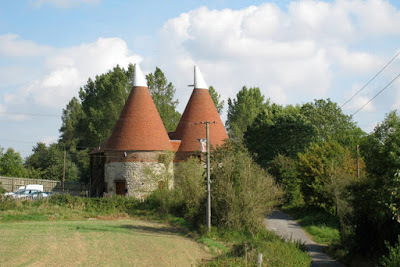 Kent was the first place in the UK to grow hops, back in the 16th century, and oast houses — circular buildings designed for drying hops as part of the brewing process — soon sprang up to process them into beer. Williamette Oast is one of four properties carved out of a single, six-roundel oast and Kentish ragstone barn, but it's the only one currently up for sale, with an asking price of £765,000. The four-bedroom property is a clever mix of old and new, retaining many of the original features including stripped wood floors and exposed wall and ceiling timbers with ironwork. The master-bedroom has an incredible domed roof leading to the cowl of the oast. The further three double-bedrooms all come with en-suites. Laid out over three floors, the kitchen occupies the ground floor of the roundel and with its solid wood cabinets, triple-oven range-style cooker, ceramic sink and granite worktops fits the archetype of a country kitchen to a tee. The spacious family room is located on the first-floor of the roundel, with an adjacent study. Set in the grounds of a fruit farm the views over the orchards stretch across the South Downs and to the coast. Offering the best of both worlds, commutes from the closest station, Paddock Wood, reach London's mainline stations Charing Cross and Cannon Street in 45 minutes.